Yacht cruising is an ideal way to unwind get active and get out into the open air, and so it is no wonder that it is such a popular way to spend a holiday adventure. With a bit of research online or in a specialist sailing magazine it is easy to find a holiday charter to suit every ability and desire. There are exciting and adventurous ‘hands-on’ holidays, or holidays to suit those tired of excitement and adventure who want minimum fuss and maximum relaxation. There are charters for beginner sailors who want to learn the basics under the tutelage of a qualified skipper and there charters for experienced sailors who want the freedom explore on their own. Bareboat, Flotilla or Skippered Charter? There are three main types of holiday yacht charters - bareboat, flotilla and skippered. Bareboat charters allow the greatest freedom for sailors because this means holiday skippers are left completely to their own devices. For such a privilege charter companies expect qualified experience to the equivalent Royal Yachting Association (RYA) level of Day Skipper. A bareboat charter is ideal for people who want to explore exactly where they want and at their own pace. A flotilla charter offers the independence of manning your own craft but with the security of sailing within a group of yachts led by an experienced skipper. This type of holiday is ideal for holidaymakers who want to socialise with other sailors. It also eases some of the pressure of knowing how and where to moor. A skippered or crewed charter is perfect for holidaymakers who enjoy the experience of sailing on board a yacht but would rather lie back and enjoy the sunshine than actively get involved. With such a charter a trained captain takes the helm whilst the crew prepares the meals.Some yacht charter companies offer short 3 day hands-on cruises around local coastal areas. This is especially good option for novice sailors who want to gain some supervised experience of life on board before committing to a more demanding longer voyage. Complete sailing novices and more experienced skippers can find some expert tuition whilst having fun on board a holiday yacht. Many charter companies both in the UK and abroad follow the standard RYA syllabus and offer courses that are designed to give students confidence and competence in sailing and skippering a yacht cruiser. A typical charter will include on board accommodation and meals, as well all the necessary equipment. 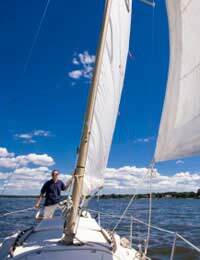 Trafalgar Sailing is one of a range of companies that offer learning to sail holidays. The spectacular waters around the coast of the UK are perfect for hands-on yachters who want a share of activity on their holiday break and are not reliant on fine weather for a good time. Popular cruising spots in the UK include the fabled islands off the coast of western Scotland and the stunning shores of the Pembrokeshire national park in Wales. For the bolder some charters offer week long voyages abroad to locations like France and the Channel Islands. Yacht cruising is also an activity that is ideally suited to the warm breezes and the reliably hot sun of the Mediterranean and the Caribbean and so it is not surprising that cruising is popular recreation for holidaymakers looking for a seafaring excitement on their trip. The Greek islands, Turkey and the legendary coast of Croatia are particular favourites amongst seasoned yacht cruisers. Holidaying aboard a traditional sailboat on the open waves offers the perfect antidote to the stresses and strains of modern life, and its charms are open to everyone however old, active or lazy.